Recruiting today is not like it was ten, five, or even one year ago. Now, candidate expectations of a company’s employer brand are much higher. Prospective employees can afford to be picky and their overall experience as a candidate with your organization will win them over to your brand—or cause you to lose them to a competitor. To maintain an edge on the competition, recruiters have to learn to operate more like marketers. They need to remain savvy about the latest developments related to the candidate experience, as well as hiring trends overall. According to a recent survey, 86 percent of HR professionals agree that recruitment is becoming more like marketing. There’s also a general consensus that the HR industry is now expected to incorporate strategies and tools traditionally associated with the marketing function into their hiring processes. Here are five ways recruiters can effectively implement recruitment marketing strategies to improve their hiring. At their core, applicant tracking systems (ATS) allow recruiters to store and track candidate profiles, jobs, and recruiting workflows in a central location. To support the modern realities of recruiting, the ideal ATS must now also function as part of an integrated talent acquisition solution suit. It must provide recruitment tools, a record of candidate touch points, communication channels, automated onboarding workflows and, above all, data analytics. And to truly get ahead of the hiring game, employers should invest in a talent acquisition platform that also includes strong candidate relationship management (CRM) tools. This will boost their ability to reach, attract, and nurture a healthy supply of prospective applicants. Whether candidates are actively looking for a new opportunity or simply wish to passively engage with a brand that may be of interest as an employer down the line, employers must leverage the right tools to simplify and automate two-way communication. In order to lure today’s top talent, employers have to learn to market themselves—and out market other employers competing for the same great candidates—and this doesn’t end with simply advertising open positions. Clearly, your reputation as an employer hinges on the unique culture depicted by your brand, as does your ability to onboard the best-fit talent. There are a variety of ways to use recruitment marketing to highlight company culture and attract the best candidates, beginning with brand management. Research shows that a whopping 94percent of job seekers are likely to apply for a job if the company actively manages its employer brand online. Nearly 80 percent of job seekers agree that the look and feel of a company’s career site is important to them when determining if they should apply for a job at the company. With this in mind, you have to decide what is your employee value proposition (EVP) and how can you use it to fill crucial seats within your organization? Boosting your employer brand online by showcasing the unique aspects of your company can change the game and you don't have to post groundbreaking information. Posting online video testimonials from current employees, promoting awards and recognition, and creating user-friendly talent pools will give prospective employees beneficial insight into pertinent company news and happenings. It’s no secret that leaving positions unfilled for a long period of time can completely derail business performance. This is why CRM technology is key to nurturing a bullpen of prequalified candidates. This approach will save you time and money when you want to find the right hires when positions become available. 72 percent of recruiters agree that candidate relationship management (CRM) tools should live within a talent acquisition system. With recruitment marketing automation, recruiters can build talent pools or talent communities by attracting and engaging passive candidates. These are people who are not yet ready to apply for a job but are interested in your company’s employment brand. They were attracted through your fully branded, mobile-optimized career site portal. Once the passive candidate data is in the system, recruiters can use talent pools to manage specific groups of candidates by function (e.g., sales, engineering, G&A). They can personalize their candidates' experience based on their relevant interests. And better yet, CRM tools offer an amazing opportunity to seed branded content in the form of scheduled email campaigns. The campaigns are curated to include information such as career opportunities, networking event registration, company information, and newsletters. Both talent organizations and job seekers see the benefits of recruitment marketing. Of the HR professionals surveyed, 76 percent felt their organizations received a strong ROI from using recruitment marketing and/or CRM technology. 71 percent of job seekers contend that it’s an effective way to identify, attract, and engage top talent. 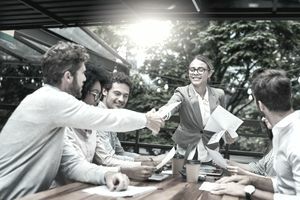 Yet there is a major disconnect between the value placed on recruitment marketing and the tools that organizations are actually implementing to make it successful. The reality is that many talent acquisition teams can’t seem to get a recruitment marketing program off the ground. Data shows that the HR department controls recruitment marketing investments at 61 percent of companies, yet only 44 percent actually feel equipped to own it. Survey respondents cite lack of budget, lack of support from corporate marketing, and inadequate technology as some of the challenges that prohibit a strong recruitment marketing program. Organizations have to look at existing processes and strategies and decide whether recruiters, marketers or a newly created partnership between talent acquisition and marketing will create the best results. Otherwise, they’re missing a tremendous opportunity to build a pipeline of great talent and set themselves apart from competitors. Recruitment marketing is definitely a multi-faceted process, and employers that are trying to find high-quality hires need their recruitment teams and tools to perform many different functions. Ultimately, though, it all boils down to understanding how and why candidates are looking for jobs and then delivering the right content to engage them. Today’s most successful recruiters adapt to evolving job seeker behavior and to the more consumer-friendly technology landscape. A marriage between applicant tracking and recruitment marketing is simply indispensable for reaching the broadest scope of desirable talent in a highly competitive and fast-paced job market.